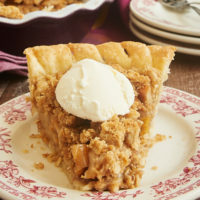 In my childhood, there were usually two kinds of pie at almost any big dinner. Pecan Pie and Chess Pie. 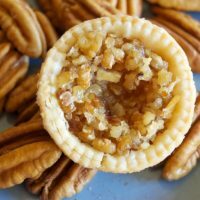 I, of course, adore Pecan Pie, and so did everyone else in the family. But, I clearly remember making the conscious decision that Chess Pie would be my favorite. Somewhere along the way, I kind of abandoned it. I didn’t do it on purpose. It was one of those desserts that someone else always made. In fact, I made my first one not that long ago. Truth be told, I am fascinated by this pie and its variations. It’s one of the best examples of how just a handful of ingredients can make something so very good. 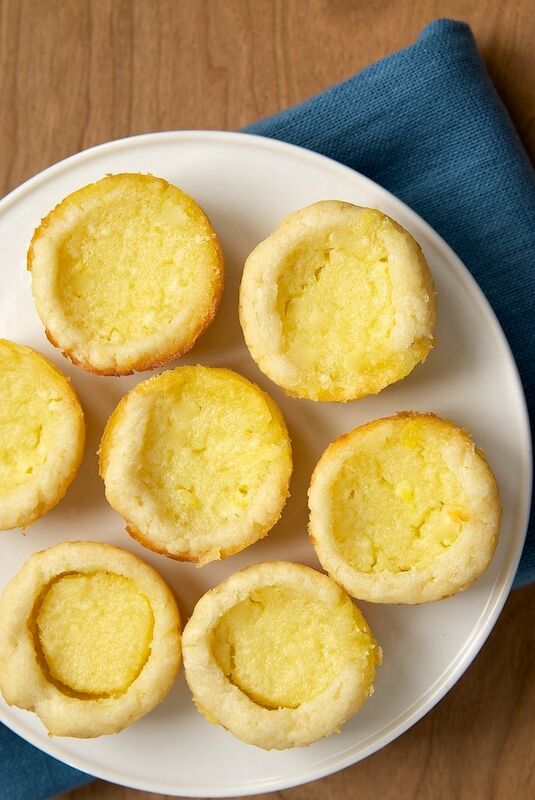 These mini versions have a lemon twist to them that’s just perfect for summer. I had some lemons left over from that amazing Lemon-Strawberry Shortcake and looked around specifically for a lemon tart recipe that would be both quick and simple. Not surprisingly, I found what I had in mind at Southern Living. Chess Pie is generally thought of as a Southern dessert, after all. 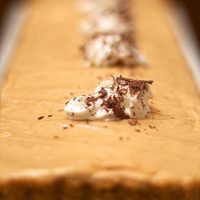 Their basic chess tart recipe has a few variations if you’re looking for something a bit different. You can dress these up easily with some toasted coconut, toasted almonds, or just a sprinkling of confectioners’ sugar. 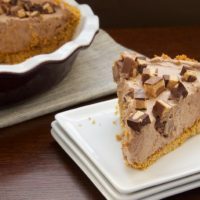 You could even add a teaspoon of almond extract or coconut extract to the filling. I opted to go all lemon on these beauties. I think they’re pretty perfect in their sweet, lemon glory. 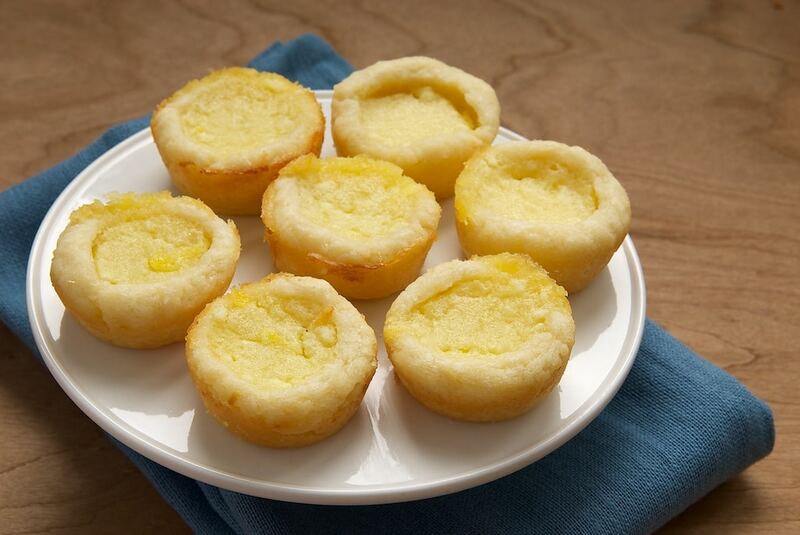 Visit the Recipe Index for more lemon recipes! 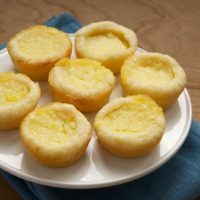 These sweet, tart mini pies are so simple to make and a pleasure to eat! Using an electric mixer on medium speed, beat the cream cheese and butter until creamy. Reduce mixer speed to low and gradually add the flour. Mix just until combined. Shape the dough into 48 balls, using a scant tablespoon of dough at a time. Place the dough balls on a baking sheet. Cover and chill for 30 minutes. Preheat oven to 350°F. Lightly grease 48 mini muffin cups. Place 1 dough ball into each cup. Press the dough into the bottom and up the sides of the cups, forming a pastry shell. If you have a tart tamper, this is a perfect use for it. Coat it lightly with a bit of flour to keep the dough from sticking to it. Whisk together the eggs, sugar, buttermilk, lemon juice, and melted butter. Fill each pastry shell with the mixture. Bake 18-22 minutes, or until the filling is set. Cool in pans on wire racks for 10 minutes. Then, carefully remove the tarts from the pans to cool completely on wire racks. If you’d like, garnish these with with toasted coconut or toasted almonds. I bet these are so tasty you can’t eat just one! Lemon is absolutely one of my favorite flavors, all year round, not just summertime! I could pop a easy dozen of these in my face in 5 seconds flat! Mini-sized desserts are the best! I have been hoping to see more lemon flavor on BoB. Thanks for sharing! I’ve never had chess pie but it sounds like I would love it, especially with the lemon to balance out all that sweet! I’ve heard of chess pie, but vaguely remember trying it. These look like they just melt in your mouth. 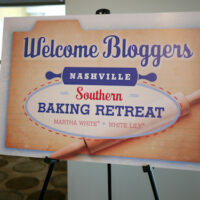 I have never heard of chess pie! I am very intrigued! I will definitely be trying this out! You left the melted butter out of the filling in the directions. Thanks for catching that, Venita! I’ve corrected the recipe. I could eat like 40 of these. And that’s not hyperbole. Any suggestions on how long to cook these in a regular size muffin tin? These are excellent! I made them a little bigger, in regular muffin tins, baked at 385 degrees for 25 minutes, and they were perfect! (I patted in the pastry half way up the tins and poured the filling a little below the lowest edge of the pastry. Worked great.) We tried them with some raspberry jam – yum! and they were also excellent with fresh raspberries or a simple raspberry sauce. Hi, Vicky. I’m sorry for the delay in answering your question. (I’m taking a little time off.) It looks like Nancy’s comment below yours might answer your question. Enjoy, Vicky! And thanks, Nancy! These were great. My family really enjoyed them, even the ones who don’t usually love lemon. I made a few with a single blueberry in the center. They were really nice too. Thanks for sharing! I made these for my mom who adores lemon! We have pie night every year on the night after Thanksgiving. I make everyone their own pie, (I made nine last year!) and hand them a fork. I collect pie plates all year so everyone can take home their own pie & not have to worry about returning the plate. My mom wanted to be surprised this year, so I made these to bring for Thanksgiving/pie night! They are delicious; (so tiny I got to try a few early!) I only wish I had the tart tamper so they would have looked as uniform and lovely as yours did! My mom will LOVE these! Thanks! So many think of using the end of a wooden spoon or a tart tamper, I have always saved wine corks, they are the perfect size and I seem to have one around most of the time. Hope this will help someone else! That’s a great idea, Phyllis! We always have plenty of wine corks around here. Thanks for sharing! These were delicious, but really sweet. 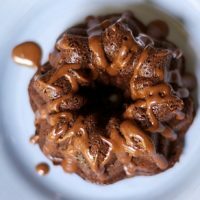 Any ideas on how to tone down the sugar without losing the custard-y texture? Hi, Sharon. You can probably reduce the sugar by a few tablespoons without altering anything else. More than that, and I’m afraid these might not turn out well. How would you store these and how long can they be stored before eating? I’d like to do these for a tea, but won’t have time on the day of the tea since serving 25 ladies is a lot of preparation. Hi, Jo. These should keep for at least 3 days in an airtight container. Hey, this is Debbie Milton in Tupelo, MS. Have been collecting vintage French patisserie pans this year and want to make these in a sweet little pan that I just received that is shaped like a gondola (barquette). I am enjoying your site so much and it is just like you–attractive, friendly, and full of classic taste (both kinds)! Thank you, Mrs. Milton! It’s so nice to hear from you. I’m sure your vintage collection is beautiful. I hope you enjoy the recipe! My friends and family enjoyed these. They said they were light and airy. I had added toasted almonds and light powdered sugar. Next time, I’m thinking of adding more lemon juice or lemon zest. Thoughts? Hi, Kristina. I’m glad these were a hit! I’d definitely add the lemon zest, but I’d be hesitant to add more than just a very small amount of extra lemon juice, as it will affect the consistency of the filling. These were excellent! My family definitely calls this recipe “a keeper”. (I did make a couple of changes to the crust– I added a tablespoon of white sugar and used salted butter plus 1/4 teaspoon salt, based on a Pecan Tassie recipe my family likes.) The sprinkling of powdered sugar made them look very special. I just discovered your website and am looking forward to reading more. I’m so glad you enjoy them, Mollie! Can we make the dough and the filling and keep it separately till we bake for a couple of days beforehand?? You can definitely make the dough in advance. I’d be hesitant to let the filling sit that long before baking. These will also keep well for a few days in an airtight container after baking.